I’ve lived in the south all my life, and grits were always a breakfast dish made with white corn grits, mixed with butter and salt; yum. I have an Italian grandmother, and now an Italian husband, and yellow corn grits has always been polenta; also yum. As contemporary American chefs get back to basic food traditions, I’m finding grits on the menu more often, and it’s not just for breakfast anymore. I was inspired to make this after a visit to Hattie’s (an American bistro with a southern low-country influence) in Dallas. 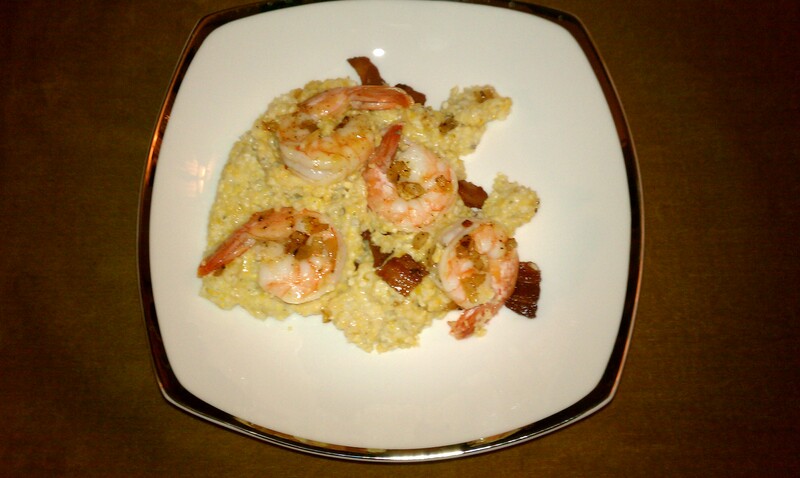 Whether you call it grits or polenta, I have an easy, yummy recipe for you. Cook the grits according to package directions; I use chicken stock or broth, instead of water, for flavor. The War Eagle grits have microwave instructions, Bob’s Red Mill has stove top instructions. Leave the grits mushy, there’s no need to let it set up in a bowl to cut into cakes. Cook the bacon until crispy, remove from pan and reserve the fat. Mix bacon fat with Tabasco Chipotle to taste. Serve hot with a big salad, a nice glass of chilled white wine and enjoy! Be well. Real food … what a concept! Bummed by raw milk shortage in Dallas? Check out real milk alternatives. The Healthy, Happy Eater · Real Food … What a Concept!